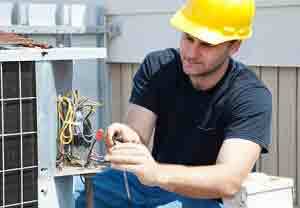 Where electrical problems are concerned, it is best to hire an electrician. You can try to do things yourself around the house, but fooling around with electricity isn’t advisable – unless you are an electrician yourself. Evaluate what work needs to be done. Are you renovating or adding a room? Or do you need a repair to an existing system? Here’s how to hire a good electrician. When you seek the services of a professional electrician to perform electrical repairs in your home or workplace, you want to ensure that the person you engage is of course qualified, certified and insured. The chosen electrician must be highly skilled and experienced in carrying out electrical services and electrical repairs. Ask friends and neighbors for recommendations and contact several electricians. If you are having difficulty locating an electrician, check your local yellow pages. Have the electricians inspect the site and bid on the job. If possible, execute a mock-up contract specifying the work to be done, with specifications, listing all aspects of the project like cost, payment schedule, start date and estimated completion date. Ensure that the electrician you’ve chosen is properly licensed and has proper insurance coverage. Inquire about the length of time each electrician has been in business. Ask your potential electrician for past customers as references and try contacting them to find out if they were satisfied with the work. Did the contractor come back promptly to address any follow up problems? The best Orange County electricians will always listen to your needs and expectations, and will provide information and detail in relation to the work required in their professional opinion. Essentially, great electricians will try to explain the work necessary using terms that you can understand and from which you can make meaning. Deciding on the electrician who will perform electrical services in your home or workplace is a very important and quite involved one. By following the tips presented in this article, you are best positioned to make a wise and effective choice of an electrician.